Find and claim your profile. Use our powerful reviews and recommendations platform to collect trusted, verified reviews and share them across your digital footprint to win new business and stand out above your competition. At the click of a button send review requests to employers and candidates. Sourcr’s vetting process ensures all reviews are trusted and 100% legitimate. 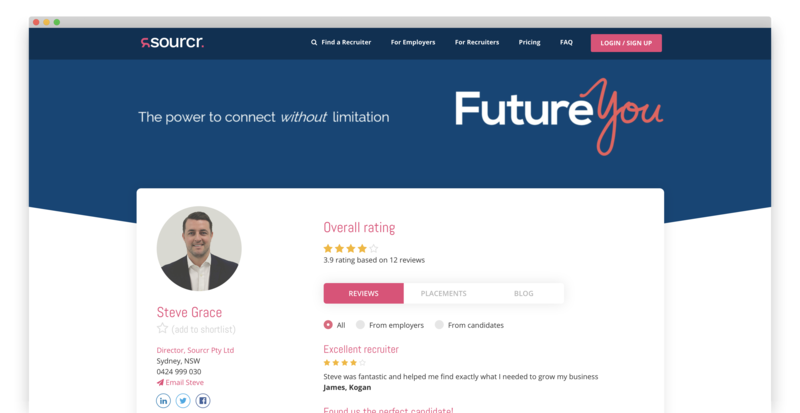 Third-party review validation boosts trust and confidence in prospective clients and employers and provide social proof to your great work. Digital branding is and increasingly important factor in decision making for clients and candidates. Boost yours by showcasing your great work. Sourcr’s ranking system showcases the best recruiters in each market. Stand our above competition by collecting great reviews.